… And looking for answers. You don’t want to mask things with drugs. You’ve been down that road. The kids are always sick. Your body feels older than it is. You’re tired of listening to your husband complaining. Your blood pressure is increasing along with your waist size. You are tired all the time. You’re upset that your child is struggling with her health and not sure what they need to be healthy. The stress in your life isn’t changing anytime soon, and it seems that that your body isn’t adapting to it either. You want to get to the root cause of your family’s health challenges. You want someone who is going to help your body function better and allow you to experience life to the fullest. To help you adapt to all that life throws at you. To help you perform at the highest level of function that you can. To function and be your very best. Everyday. 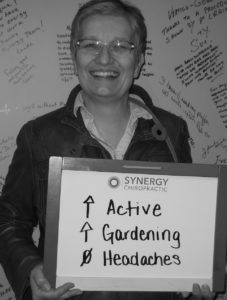 That’s what Synergy is all about. Working with you to help you realize your family’s health goals. 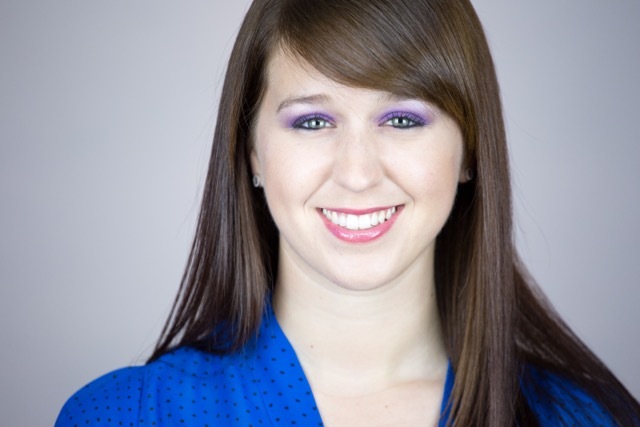 Click here to see more amazing success stories! Hi! I’m Dr. Craig Hazel! My passion for helping people live life to the fullest is what drives me. When I was growing up, I was constantly sick. Colds. Sinus infections. Bronchitis. I was on antibiotics all the time in my teens. It wasn’t until my second year of university that I discovered Chiropractic. 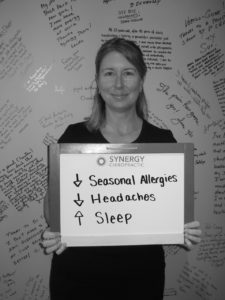 I was suffering from post-concussion syndrome, excruciating headaches, frequent colds and stomach problems. I tried conventional medicine and rest for nearly three years with limited results. A friend suggested I try chiropractic. No one was more skeptical about chiropractic than I was. After several weeks of starting care, I began to experience something I had never felt in a long time – I felt nothing. No headaches, no sinus pain, no more colds, aches and pains vanished and my energy tripled. I was so amazed that I decided I wanted to be a chiropractor. I completed my undergraduate degrees at Queen’s University before continuing onto Parker College of Chiropractic in “Big D” – Dallas, Texas. While there I became passionate about working with kids. I love seeing the changes in them and how quick they respond to care. 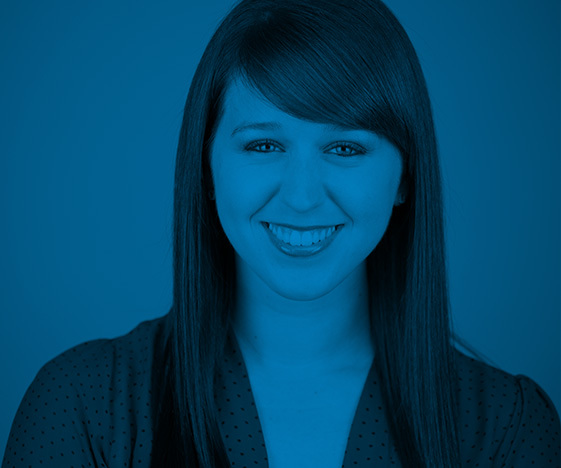 My pediatric certification really sets me apart in my ability to help with highly challenging and difficult cases such as ADHD, sensory processing disorder, and even things such as Down’s Syndrome, Cerebral Palsy, and Epilepsy. 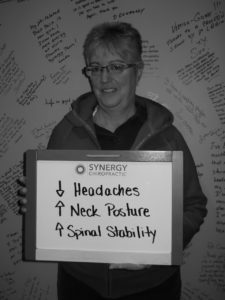 While chiropractic in general is helpful in these cases, our expertise and level of specific neurologically-based care allows us to get the highest level of results in these areas. We have created a family-friendly office that always puts education and inspiration first. I spend as much time as I can conveying a message of health and hope to my practice members and my community. We are deeply passionate about helping children grow up healthy and happy. My wife Sarah helps us at the office behind the scenes. 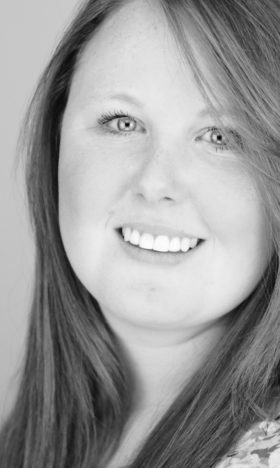 She is active booking outside community workshops and events and is busy in raising our kids Kate and Ashton. She is always making sure they are happy, healthy and doing something exciting! 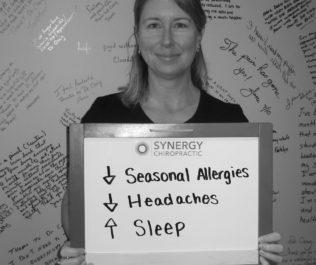 My own personal health is always a top priority, and I am always certain to get my weekly chiropractic adjustment. I also keep fit with Crossfit and make sure I’m fueling my body with the best nutrition. I love to play hockey (I’m a goalie. :-)), play golf, mountain biking and fishing. I love fishing. I think mostly because it is so relaxing and it gets me out into nature. I don’t keep any of the fish I catch. Just like to catch them. 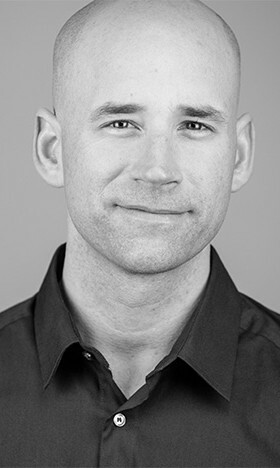 I am currently serving as the Chairman of the Alliance for Chiropractic of Ontario. 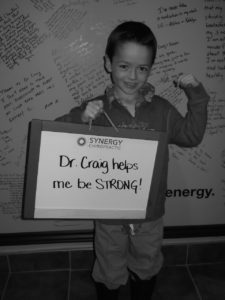 We serve to provide support and leadership to the Chiropractors in Ontario. I want to thank you for taking the time to check out our site and learn more about us. I hope that you can see how dedicated we are to helping you and your family. 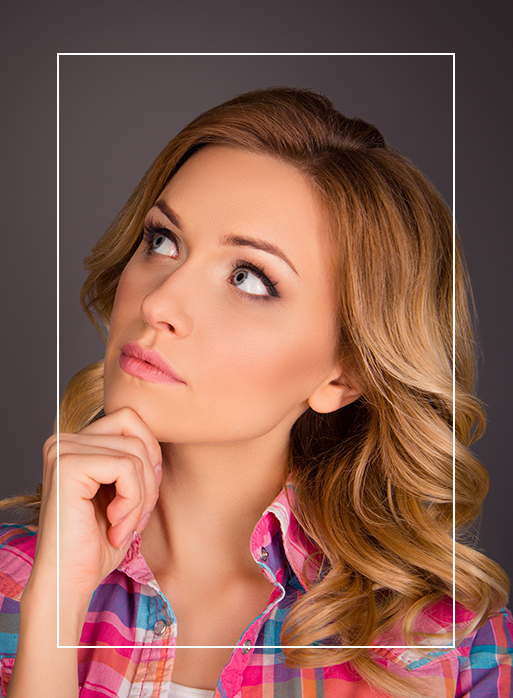 If you find yourself asking, “I wonder if chiropractic can help me?” I will tell you the answer is most likely a resounding YES! Call our Kanata chiropractic office today and take your first step to a better life. 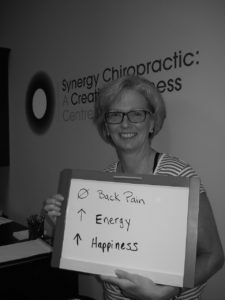 … And Chiropractic changed my life. 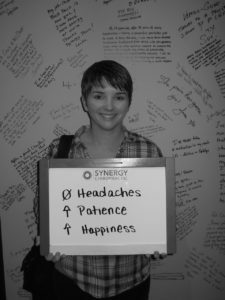 I walked into Synergy in 2007 believing what I felt on a daily basis was normal. I walked out knowing there was a better way of living. 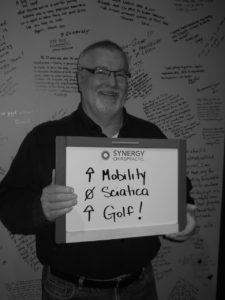 Synergy and Chiropractic have gotten me through some extremely hard times in life and I thrive on being part of other people’s similar journeys. When I took a “job” here two years into being a patient, the intent of it was to be temporary position while I figured out what I wanted to do. Turns out it wasn’t about what I wanted to do but what I was meant to do, so here I am. I love seeing people every day and doing my part to help them navigate their way through improving their health. I appreciate a person’s drive to get off countless medications and live their best life, and I will do anything in my power to support that wholeheartedly. 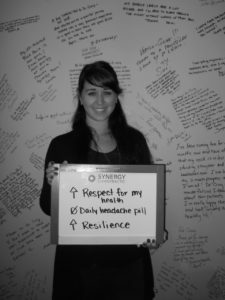 In addition to being the Director of First Impressions at Synergy, I am also a Certified Holistic Health Coach. Everyone has aspirations of changing something in their lives they are not happy with, either physically, mentally or nutritionally. 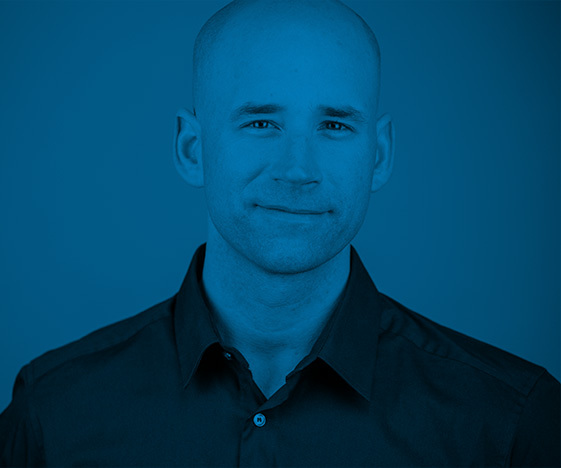 I come in as an accountability partner and resource, and work with clients on a weekly basis to fulfill those goals within a realistic timeline. When I’m not at the office, I’m either at the gym kickboxing, or with my husband, Mike, our daughter Everleigh, and our 3 dogs. I can also be found working on my charity, Families First Community Cancer Support, which supports and provides financial relief to cancer-burdened families in my community. While growing up, I was involved many different types of sports that lead me to a variety of injuries that required me to experience all kinds of rehabilitation treatments. 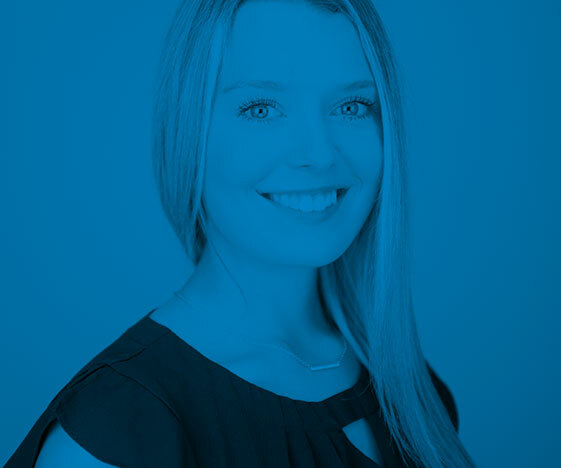 When deciding on my career path, I was very devoted to helping people by enabling them to live their day to day life as healthy and as happy as possible. 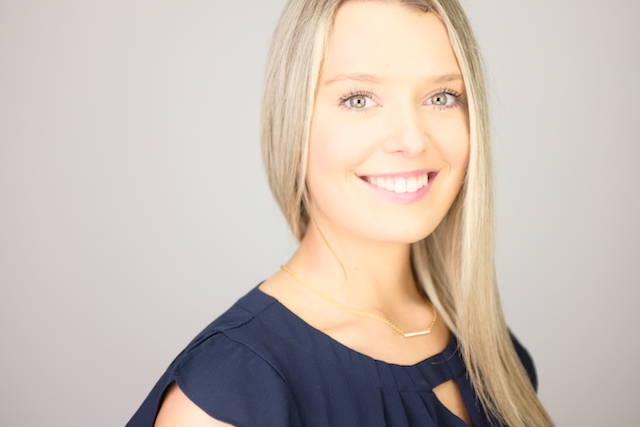 I graduated from the Physiotherapy Assistant and Occupational Assistant Program at La Cité, where I discovered my true passion for the human body. 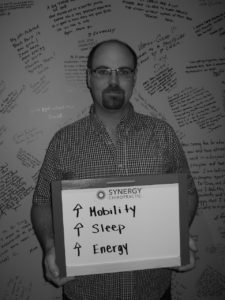 I’m excited to be a part of the Synergy team! I love how vibrant and energetic all of the practice members are and how excited they are to be here. It’s great to see people healing and functioning better after each visit. When, I am not at the office, I am all about living a healthy lifestyle. I love the outdoors; I like to run or bike during the summer to enjoy the sun and fresh air. I also enjoy going to the gym to work on different muscle groups and take spin classes. I also am an avid competitor in competitive level horseback riding, jumper division. Born and raised as a country girl, I have been no stranger to regular bumps and bruises. Between four- wheeling and hockey, my body was constantly under physical stress. It wasn’t until I started working in a chiropractic office that I began to realize the effects my lifestyle had on my body. I attended Algonquin College for the Medical Office Administration course, and throughout my studies I had worked for a few medical doctors. Upon graduating in 2014, I was offered a maternity leave contract position in a chiropractic office. 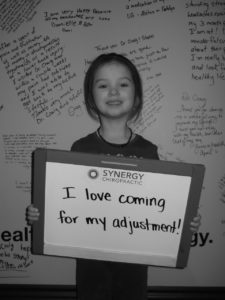 Chiropractic initially started out as just a job to me. I had never been a patient, nor had I ever been introduced to what it was really about. When I received the results of my examination, I was shocked. I always knew what a spine was supposed to look like, and when I saw my x-rays, I knew that I was not looking at a healthy spine. I also came to realize that how I felt was NOT normal. 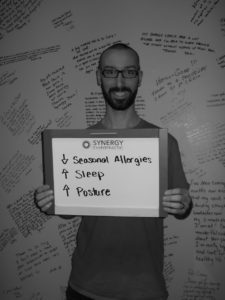 All of the symptoms I felt for so long, I had chalked up to being just a normal, exhausted student; no energy, getting sick several times a year, headaches up to 4 times a week, and various body aches. 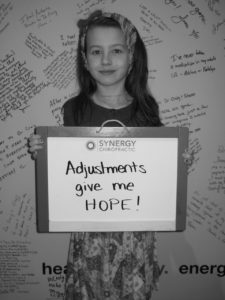 I’ve been receiving regular adjustments for a couple of years now and I can honestly say that chiropractic has changed my life. I have hope now that as I age, my years can be filled with vitality and not aches and pains; they can be filled with activity and not medications. I have more energy than I ever have, I am rarely sick, and no longer suffer from constant headaches. I am still quite active and so I still have aches and pains, but instead of running to the medicine cabinet, I run to my chiropractor! appreciation and say the words “I have my life back”. When I’m not at the office, I enjoy spending time on my parent’s farm with my husband and friends, and playing hockey – something I had not been able to do for many years until I began chiropractic care. 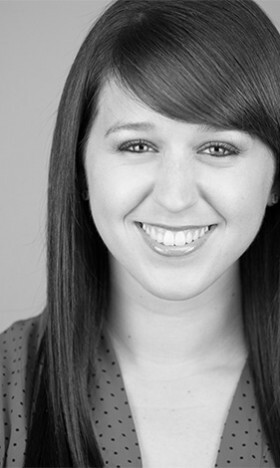 Click on our smiling faces to learn more. 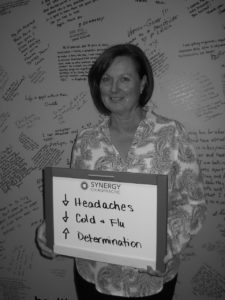 What Can I expect from Synergy? Many people are often overwhelmed, and maybe even nervous, when visiting a chiropractor for the first time. Paperwork needs to be completed, an honest discussion needs to be had, and an action plan will follow. What you will find once visiting our office is a warm and inviting space built for families. When you arrive you will notice how different our office feels from other doctor’s offices. We will have a conversation on what your health concerns are and what your goals are. We have been working for many years in our community and after working with 1,000’s of people, we are confident that your experience in our office will be a very educational and informative one. Our first visit is where we gather up all the information of what brings you to our office and how we can help. This first meeting will last about 60 minutes for both the consultation and the examination. This is foundational because it will offer our team an opportunity to help determine what we need to do to help you restore your health and be your best. In the second visit, we will spend between 30-45 minutes reviewing all the information gathered in the first visit in order to develop an individual plan of action based on what we found; how we found it and what we need to do about it. In addition, we will answer any questions like ‘how long will it take?’ ‘How much will it cost?’ etc. We encourage you to complete the NEW PATIENT FORMS prior to visiting the practice because this will save approximately 15-20 minutes and allow you to feel extremely comfortable in your own home. If for some reason you have any questions, one of our team members will support you once in the office. Our consultation is unlike any first office that you have experienced in the past because instead of addressing “what” brought you into our office, we look at “why” this is happening in the first place. This is also known as finding the CAUSE of the problem and then creating a proper action plan. We listen to our practice members so that we can understand what challenges you experience, how it is impacting your life, and then what we can do together in order to resolve them. Our intention is to help our practice members understand how nerve system interference can affect your health and how the chiropractic wellness lifestyle can help you live to the fullest. Our assessment utilizes the most state of the art technology (neuro-spinal assessment) in order to objectively determine what the problem is. We will perform a number of other assessments including palpation, bio-structural postural assessment, digital computerized nerve system scans and any necessary x-rays. You are in control of your health and we are here to guide you to the best decisions by giving you our best options. Your condition might require an x-ray analysis in order to truly assess where the challenges are in your spine and nervous system. If/when we decide to perform a series of xrays, this will allow us to clearly determine the next steps. X-rays provide us with an objective diagnostic tool, along with important information including the position of the spinal bones, and the health of of the spinal joints and the safety of adjusting it. We also use x-rays to determine how long the subluxation (structural misalignments) have been in your spine. You will be scheduled for your Report of Findings within a few days of your initial visit, which is where we will determine the best Corrective Plan. Our office is unique in that we utilize technology to the fullest to help us determine the problem and it also gives us objective feedback over the course of time so we can see how you are doing. In addition, we will instruct you and provide counsel on lifestyle changes that will help you get the best and fastest results possible. This will be catered to meet your needs, but could include nutritional advice, exercise tips, strategies for stress relief, etc. We recognize that every body is extremely unique and different, which is why we consistently update and customize your care. 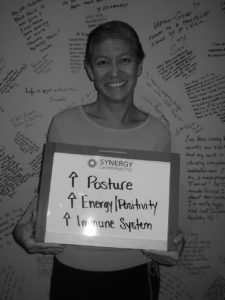 The foundation for our overall health is based on proper spinal alignment, nutritious foods, regular exercise, high quality supplementation, and a variety of stress relief techniques. 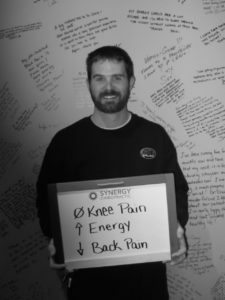 At Synergy Chiropractic our objective and our focus is: Neuro-Structural Correction. Most of the cases that we see in our office, which are commonly by referral from other local chiropractors and medical doctors, are for the correction of significant Neuro-Structural Shifts of the spine. The presence of one or more Neuro-Structural Shifts of the spine is typically the underlying cause of many “symptoms”— or what Neuro-Structural doctors refer to as Secondary Conditions. Neuro-Structural Correction focuses on the underlying cause- the Neuro-Structural Shift. First thing we want to address is that we will never schedule you for an examination before first having gone through one of our complimentary consultations. We do this as a courtesy to you so that we can learn about you and so that you can determine if we are the right solution for you. After a consultation, we will always be willing to go straight into a Neuro-Structural Correction Examination if you are ready, or schedule an examination for a later date if you so desire. It is your choice! A Neuro-Structural Correction Examination is a comprehensive exam that will take no less than 45 minutes to complete depending on the severity of your case. Our Neuro-Structural Correction Examination is designed not only to find Neuro-Structural Shifts of the spine, but also to show you how your spine compares to normal. We take the time to not only look at your structure from the outside with our Neuro-Structural Correction Assessment, but we also look from the inside with our Neuro-Structural Corrective Radiographs, and Computerized Neurological Scans. You should walk out of our examination knowing what normal looks like and with a general idea of the severity of your case. After your examination we will schedule you for a conference where we will review the results of your exam, explain how we can help you, and discuss how we will proceed if you decide to work with our office. We recognize that every body is extremely unique and different, which is why we consistently update and customize your wellness programs. The foundation for our overall health is based on proper spinal alignment, nutritious foods, regular exercise, high quality supplementation, and a variety of stress relief techniques. It is important to emphasize – chiropractic is NOT a treatment for any condition specifically. Chiropractic care enhances the inherent recuperative ability of the body to heal and function at its best. When the body is functioning and working properly, often times the body heals and the complaints resolve. 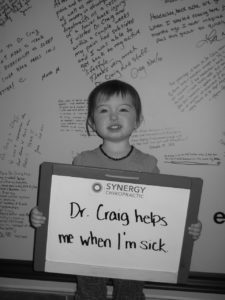 We’ve produced numerous articles, webinars and workshops that explain how chiropractic helps with a number of health challenges in children. Absolutely! We have helped hundreds of pregnant women have an easy, painless and smooth pregnancy and delivery. Pregnancy brings with it all sorts of changes to a woman’s body. The stress of carrying extra weight and the demands of work, family and appointments can be eased with gentle chiropractic care. We utilize the Webster Technique to aid in breech baby presentations. While not a breech turning method, the Webster technique focuses on restoring proper pelvic biomechanics and physiological state of the uterine ligaments. When the uterus and pelvis are in their proper aligned position, the baby often moves themselves into the most ideal position for delivery. You may have heard the notion that once you go to a chiropractor you have to keep going back. No, you don’t have to keep coming. However, most every patient of ours understands that after investing time and money to restore their health, it makes good sense to protect their investment. 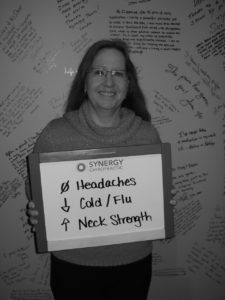 At Synergy, we do have a wellness based practice that includes over 70% of our patients coming regularly for protection long after their symptoms have subsided and they are feeling great. Since all live our lives through our nervous system, it’s important to keep it running optimally. Like eating well, exercising or meditating – how long you choose to benefit is always up to. Chiropractic works by restoring your body’s inborn ability to be healthy. When under the proper control of your nervous system, all the cells, tissues, and organs of your body are designed to resist disease and ill health. Chiropractic care, in our office, approach to better health is to locate and remove interferences (subluxations, misaligned vertebrae) to your nervous system. With improved spinal function, there is improved nervous system function. The goal of the chiropractor is to remove interference that may be impairing normal health through specific chiropractic adjustments, allowing your body to heal itself. A healthy spine and a healthy lifestyle are your keys to optimal health! If we feel we can help, we’ll tell you. If not, we’ll help you find the best person who can. A consultation is always a conversation and never a commitment.